From the moment Sandra Brannan’s Liv Bergen mystery series appeared, it was clear that she was not going to follow the traditional formulas for writing these types of adventures. In the first two books – In the Belly of Jonah and Lot’s Return to Sodom – her main character, Liv Bergen, and the man who appeared to be her series love interest, Streeter Pierce, hardly even interacted with each other. And just when they began to get close in Widow’s Might, their relationship was derailed by complications beyond their control. 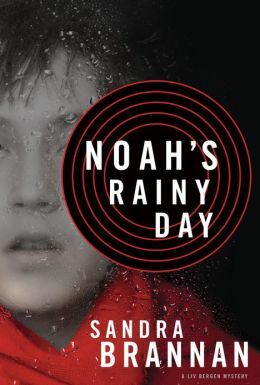 Never one to take the easy road, Sandra Brannan has now returned with Noah’s Rainy Day, presenting yet another twist on what readers are expecting. As the novel begins, Liv Bergen has just returned from training at Quantico and is immediately thrown into her first case. A five-year-old boy named Max has gone missing from the airport and the time-frame for finding him alive is quickly dwindling. The kidnapping case requires Liv to work with both of the men in her life, Streeter Pierce and Jack Linwood, but with no time to focus on her own personal relationship dilemmas, she sets her mind to tracking down the missing boy. The previous books in this series were written in the first-person from Liv’s point of view. While readers again see things from Liv’s perspective in Noah’s Rainy Day, Sandra Brannan also gives readers the occasional first-person chapter from Noah’s viewpoint. As long-time fans of the series know, Noah Hogarty is Liv’s twelve-year-old nephew and he suffers from cerebral palsy. This debilitating disease limits Noah’s movements and leaves him unable to speak. Yet his mind is still sharp and through his own forms of communication, he loves the idea of helping his Aunt out with her investigations. When Noah observes a strange young boy looking out of the neighbor’s window, he has a suspicion that something is not right. As he begins to put together the pieces, Noah is unable to relay his concerns to his family and Liv is busy working on her current case. Will his snooping result in his own life being put in danger? Unlike the other books in the series, the plot of Noah’s Rainy Day covers only two days around the Christmas holiday. Brannan is able to keep the tension high by working within the confines of this narrow window of time. From the opening chapter, where Liv and her bloodhound Beulah are forced to confront a mountain lion while hiking in the mountains through to the desperate race against the clock in the final chapters, readers will be unable to stop turning the pages, eager to see how this case is solved and to ensure that their favorite characters survive the ordeal. As exciting as all of this is, it is once again the characters that really shine in this novel. Brannan continues to mine the depths of Liv Bergen’s personality, detailing how she relates to the new stresses thrust upon her. And one would be hard-pressed to find a more fleshed out child character than Noah Hogarty. The chapters from Noah’s point-of-view are all the more remarkable for his inability to speak. Sandra Brannan gives a voice to those afflicted with cerebral palsy, and one cannot help but to cheer for this young boy and the strength he exhibits in spite of his limitations. With Noah’s Rainy Day, Sandra Brannan once again proves that she is one of the unsung stars of the mystery genre. Her books deserve a larger readership and if she continues to put out quality work such as this, she will no doubt achieve just that.